Is your family melting during these hot summer days? Are the kids going stir crazy in the house when they can't get to the pool? Are you looking for games and activities to keep them entertained (and maybe learning just a wee bit)? If you're one of the families learning a new language (Spanish!) 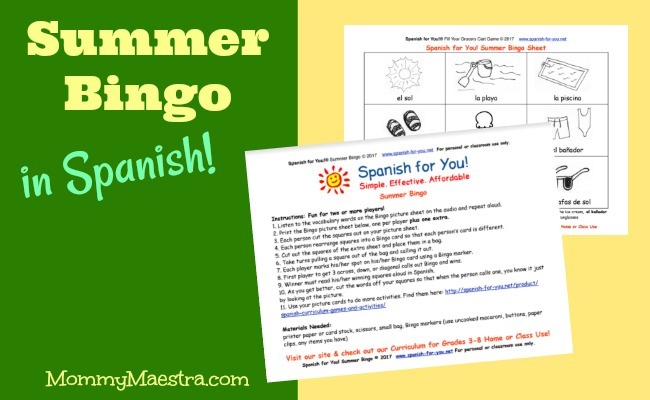 this summer, here's another wonderful printable game from MommyMaestra sponsor, Spanish for You! Your young Spanish learners will discover new vocabulary related to summer with this fun activity. This 2-page activity comes with an audio file to help young students learn proper pronunciation. The activity includes directions and a bingo board template.